Made in Philipsburg, PA USA with North American raw materials. 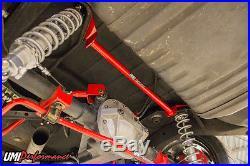 1978 - 1988 GM G-Body Rear Coil-Over Kit, Bolt-In 150lb. Springs - Street & Cruise. Proudly made in the USA by UMI Performance Inc. 1978 - 1988 Chevrolet Monte Carlo, Malibu, El Camino 1978 - 1988 Buick Regal, Grand National 1978 - 1988 Pontiac Grand Prix, LeMans 1978 - 1988 Oldsmobile Cutlass. 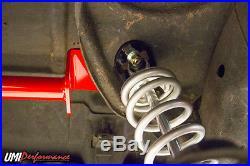 The upper mount reinforcement is a direct bolt-in and holds a true 2-1/2 racing coilover with T-Bar. 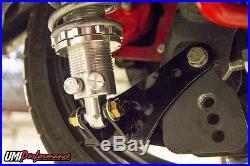 The FEA designed lower bracket bolts in using the standard trailing arm mounting hole as well as an additional reinforcement hole normally used by the standard rear shock. The Viking shock is 19-way adjustable in both compression and rebound and ensures the perfect setting for every application. The 2-1/2 coilover springs are available in 14 110lb for drag use, 12 150lb for street use and 12 225lb for auto-x/road race. 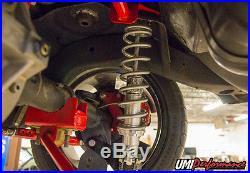 UMIs rear coil over kit also works if your car previously utilized UMI P/N 3010 weld-on relocation brackets. 100% designed, manufactured and raced out of Philipsburg, PA-USA and always US materials. 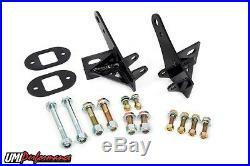 Brackets manufactured entirely from 3/16 Made In USA mild steel. Laser cut for consistency and a precise fit. Powder coated black for a long lasting finish. Viking Warrior double adjustable shocks offer 19 compression and 19 rebound adjustments. Viking Crusader valving available for Pro-Tour and Drag specific applications. (See P/N 3149-225 & 3249-110). 3 spring rate options depending upon application. 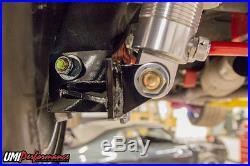 Sliding slot included for use with control arm relocation brackets. 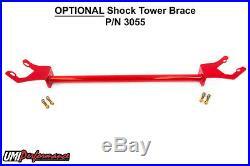 Optional shock tower reinforcement brace available. Designed, tested, manufactured and raced in Philipsburg, PA-USA. Note: Rear shocks may not clear all exhaust tail pipes. UMI is not responsible for exhaust clearance issues. Spanner Wrench & Thrust Bearing Kit (Optional - See Below): Spanner wrench tool is used to adjust vehicle height while shock stays mounted. This wrench is needed to make height adjustments. The thrust bearing kit is designed to be placed between the spring and the spring seat attached to the shock. This makes for easier adjustments since the spring seat is rotating on a bearing. This kit is recommended for easier adjustments but is not needed to complete the installation. We do not recommend adjusting height on the car without a thrust bearing kit. UMI proudly designs and manufactures its entire line of products within its facility located in the small town of Philipsburg, PA. UMIs facility features CNC machining and laser cutting, band sawing, press brake operation, MIG and TIG welding, sand blasting, powder coating and product design. From humble beginnings in his father Dennys machine shop, Ryan Kirkwood used market savvy and a core group of dedicated employees to develop UMIs line of 100% Made in Philipsburg, PA USA products. Today, UMI operates out of a 35,000 square foot facility staffed with 30 hardworking and dedicated employees. UMI manufactures 99% of their products within their facility from start to finish - from raw 24 foot bars of USA tubing and 8 foot sheets of steel plate to a finished product on your door step. UMI is very proud of their success over the past 12 years, and would like to take the time to thank each and every customer for their support. UMIs 30 hardworking employees are proud to offer you an American made product, hand crafted and fabricated with blood, sweat and pride. It is not valid against defect resulting from, but not limited to. Misuse and/or abuse, neglect or accident. Exceeding the items design limits. Acts of God, including lightning, floods, earthquakes, fire or high winds. UMI Performance cannot guarantee compatibility or performance of its products with other components used in conjunction with UMI Performance products. UMI Performance cannot assume responsibility for any damages to UMI Products nor for claims for personal injury or property damage resulting from the use of UMI Performances products or the improper operation thereof or consequential damages arising from the products or use of the products. By their very nature, competition suspension parts are continuously expected to exceed to their limits (either by race or road use). UMI suspension components are designed to withstand intense race conditions, although it is impossible to control the quality of installation or the varying conditions in which they are used. 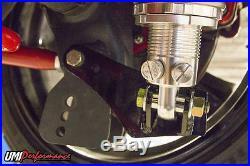 We are not responsible for fitment issues regarding the use of other aftermarket items. 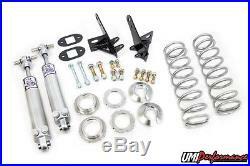 The item "UMI Performance 78-88 GM G-Body Rear Coil-Over Kit Bolt-In with 150lb Springs" is in sale since Wednesday, February 25, 2015. 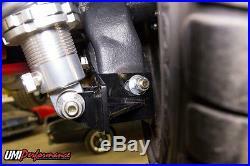 This item is in the category "eBay Motors\Parts & Accessories\Car & Truck Parts\Suspension & Steering\Control Arms & Parts". 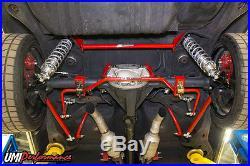 The seller is "umiperformance" and is located in Philipsburg, Pennsylvania. This item can be shipped to United States, Canada, United Kingdom, Denmark, Romania, Slovakia, Bulgaria, Czech republic, Finland, Hungary, Latvia, Lithuania, Malta, Estonia, Australia, Greece, Portugal, Cyprus, Slovenia, Japan, Sweden, South Korea, Indonesia, Taiwan, South africa, Thailand, Belgium, France, Hong Kong, Ireland, Netherlands, Poland, Spain, Italy, Germany, Austria, Russian federation, Israel, Mexico, New Zealand, Singapore, Switzerland, Norway, Saudi arabia, Ukraine, United arab emirates, Qatar, Kuwait, Bahrain, Croatia, Malaysia, Brazil, Chile, Colombia, Costa rica, Panama, Trinidad and tobago, Guatemala, Honduras, Jamaica. Part Brand: UMI Performance Inc.